The design of the watch is My idea of the question of what time is it? watch is a Huichol Mandala stitch that I modified. Done in Freeform Peyote with links to tutorials. from Out on a Whim! 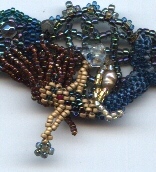 From Her 'One Bead at a Time Vol. II' book! started with the basic freeform peyote added to Huichol St. medallion. then began to Embellish her in pearls and crystals and mother of pearl and more beads. and some close ups of the wristbands. I encourage you to use your imagination and PLAY BEADS! and visit Serenity by Design for a real treat! This was so fun to do! Lemmeno whatcha think!